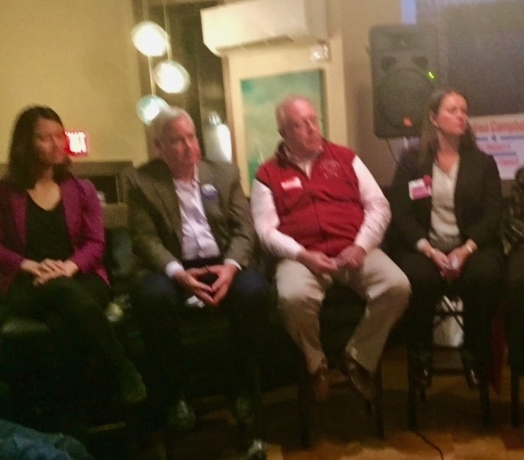 Last night the Dorchester-based group DotOut held its candidates Forum at the Savin Bar and Grill. The candidates were asked five questions, and all answered them. I will now give my own answers to those questions, on behalf of Here and Sphere readers, and note the at-Large candidates’ coincidence or lack thereof. Question One : Mayor’s Office of Workforce Development calculates that the living wage in Boston is $ 14.11/hour. Massachusetts minimum age is currently $ 9.00/hour…. In your view, what role should the City Council play in regulating the minimum wage in the City of Boston ? Answer : I agree with the City’s finding. I support the $ 15.00/hour wage that is the subject of an upcoming ballot initiative. By law, the State regulates wage issues; the City cannot. Advocacy on the State-wide level is my response. I’m doing it. Best candidate answer : Murphy 1, Flaherty 2, Pressley 3. Wu and Essaibi George gave general but not specific answers. Answer : Boston can pass a City ordinance establishing pay equity as City policy and enforcing it as to businesses in dealings with the City. On the state level, I support the Attorney General using her authority to protect wage equity by bringing suit against employers accused of violating it. Best candidate answer : Pressley 1, Essaibi George 2, Wu 3. Mike Flaherty answered generally, Murphy even more so. Question Three was a question about Pre-Exposure Prophylaxis, an HIV treatment option whereby persons with a high risk of exposure to the disease even though not yet carrying it, can take up to one pill a day as a prevention measure. Answer : I support the City making residents aware of this option through including it on its Department of Health website. Best candidate answer : all five candidates answered approximately as I have. Question Four : Last year’s unprecedented snow crippled the T for far longer than anyone could have predicted. Boston.. residents bore the brunt…especially those…who are most vulnerable. Some of the solutions being proposed include fare hikes (which)…would have highest impact on the most vulnerable. Understanding that the T is managed at the state level, what will you do to be an effective advocate for your constituents as…to the MBTA ? Answer : I support the full palette of measures being put in place by Governor Baker, including systemic reform, infrastructure repair, management detail, outsourcing of late night and low-use routes, and oversight of expenditures, work performance, and fare collection. For City T riders, one measure I’d like to see is enclosure of outdoor T kiosks so that people waiting, sometimes for up to 20 minutes, for a bus or train can have safe protection from cold and weather. Best candidate answer : Mike Flaherty 1, Essaibi George 2. Pressley and Wu mentioned continuance of late night service. Murphy noted the state’s neglect of T repair during the past 15 years. Question 5 : asked whether Councillors support re-instituting rent control as a measure to protect affordability of Boston housing. Answer : Rent control was a disaster when we tried it in the 1970s, a failure for every reason. It created a large and expensive bureaucracy, fostered under-investment an d neglect by rental owners, and in some cases encouraged corruption, as tenants of rent controlled units subleased parts of their living space to others at whatever they felt like charging. Fact is that you cannot take the value out of real estate., If you try to block it here, it resurfaces there. Fortunately it is now barred by state law.If we want to assure availability of affordable housing, build more affordable housing. Best candidate answer : Essaibi George. Flaherty touted an initiative of his own. Wu and Murphy mentioned support for a “just cause” eviction ordinance. Pressley, however, actually supports reinstituting rent control — an unfortunate position completely at odds with her mostly business-encouraging agenda. My overall impression is that few of the at-Large Council candidates are wiling to address these issues bluntly, with analysis that goes deeper than today’s urgency. I suppose that is why they are candidates, and I am not. Nonetheless, few gave answers entirely lacking in authority. Readers can be confident that none of the five is a fool. In today’s political climate, that’s encouraging.